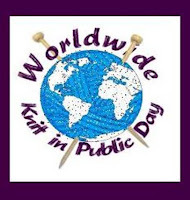 Don't forget that tomorrow is Saturday, June 9, World Wide Knit In Public Day! Join us at Griffin Park in Windham, NH between the hours of 10-5 - we will be hopefully in a somewhat shady spot and will be the ones Knitting, Crocheting, Spinning or possibly even weaving! Bring your chair and refreshments - we will have coffee and donuts for the beginning of the event and look forward to seeing you! Not in the New Hampshire area, click here for a location near you! Join in the fun and let us know where you knit - send us pixs to post and have a great day! 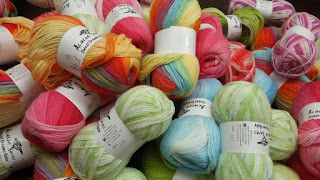 (In case of rain, we will meet at the shop and knit in the lobby at the Yarn and Fiber Company, Country Shoppes Mall, 58 Range Road, Windham, NH 03087. Can't be in the sun for long, then head straight to the shop and join in with the other knitters who prefer an indoor event - Just remember to have fun with us!